Did you know that in southern Illinois there is an area referred to as the French Creole Corridor? The areais in the Mid-Mississippi area and is in southern Illinois and northern Missouri. The area was settled by French missionaries from Quebec and traders that blended into the Indian population and created their own culture before the Spanish arrived. The French missionaries arrived in Cahokia, Illinois in 1699. One of the remains from this early time period is the lovely Cahokia Courthouse. I took a trip with my mom, and our friend’s Joy and Rose to check out this early French history. Our first stop on the French Creole corridor was the Cahokia Courthouse. 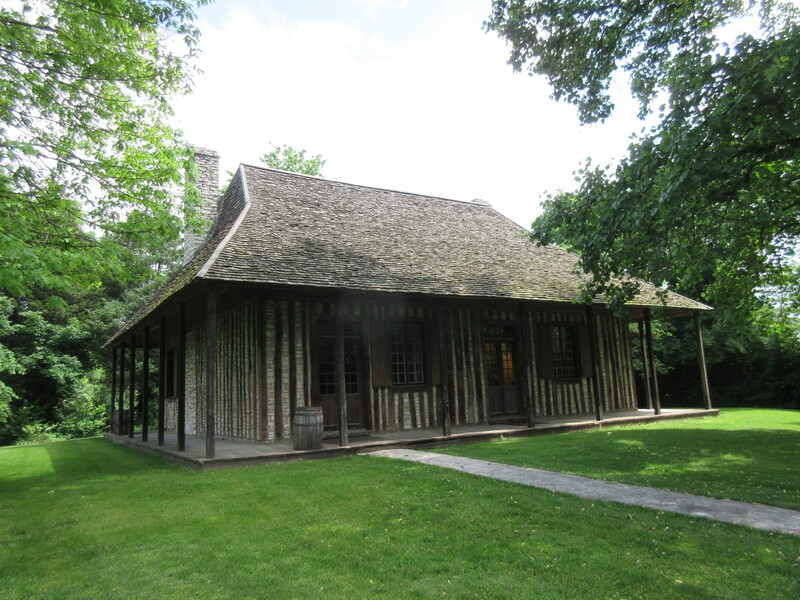 The Courthouse is a vertical-log building originally built and used as a residence by Francois Saucier around 1744. This distinctive French architecture is also referred to as poteaux-sur-solle (post-on-sill foundation). The upright hewn logs are seated on a horizontal log sill; the spaces between logs are filled with stone and mortar chinking. The building in the early 1900’s was the Courthouse Saloon then it was purchased and built to sell souveneirs at the St. Louis Wolds Fair before being brought back and re-erected. Inside today there is a small museum with displays showing exhibits about colonial life. There is a visitors center next to the courthouse and it is worthwhile to take a minute and ask for a tour of this historic site that is open year round. Call 618-332-1782 for information.